Greg Wilson has been a full time real estate agent since 1985. With over 75 million in sales and an extensive knowledge in all aspects of residential real estate, he has the skills to help you find the perfect home! There has never been a better time to buy a home, especially in Idaho - one of the nations top states for growth! Boise is centrally located to many area entertainment venues, recreation opportunities and more. 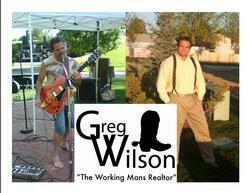 Greg Wilson knows Idaho; he can help you find the right home in the right place for you! Learn the current market value of your Idaho home by filling out this short questionnaire. Move to the Boise area? Fill out our simple form and receive a free electronic relocation kit in minutes with tons of useful links and info! Corey Newell NMLS 24591 208.571.1892 | 208.321.4300 cnewell@evergreenhomeloans.com Choosing the right lender is key to managing your mortgage. Our goal is help choose which program is most beneficial for your long term goals.